This website is operated by PRC PAC. 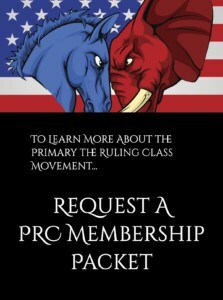 These Terms of Service apply solely to your access to, and use of, the PrimaryTheRulingClass.com website (https://primarytherulingclass.com/) operated by PRC PAC and other PRC PAC websites, services, API’s, Store and mobile applications and other social media applications which link to these Terms of Service (the ‘Sites’). These Terms of Service do not alter in any way the terms or conditions of any other agreement you may have with PRC PAC for products, services or otherwise. All questions or comments about the Sites or site content should be directed to bill@primarytherulingclass.com. Unless otherwise indicated in the Sites, the Sites and all content and other materials on the Sites, including, without limitation, PRC PAC’s logo, and all designs, text, graphics, pictures, information, data, software, tools, widgets, sound files, other files and the selection and arrangement thereof (collectively, the ‘Site Materials’) are the proprietary property of PRC PAC or its licencors or users and are protected by U.S. and international copyright laws. You are granted a limited, non-sublicensable license to access and use the Sites and the Site Materials for your informational, non-commercial and personal use only. Such license is subject to these Terms of Service and does not include: (a) any resale or commercial use of the Sites or the Site Materials therein; (b) the reproduction, distribution, public performance or public display of any Site Materials, except as expressly permitted on the Site; (c) modifying or otherwise making any derivative uses of the Sites and the Site Materials, or any portion thereof; (d) use of any data mining, robots or similar data gathering or extraction methods; (e) downloading (other than the page caching) of any portion of the Sites, the Site Materials or any information contained therein, except as expressly permitted on the Sites; or (f) any use of the Sites or the Site Materials other than for its intended purpose. Any use of the Sites or the Site Materials other than as specifically authorized herein, without the prior written permission of PRC PAC, is strictly prohibited and will terminate the license granted herein. Such unauthorized use may also violate applicable laws, including, without limitation, copyright and trademark laws and applicable communications regulations and statutes. Unless explicitly stated herein, nothing in these Terms of Service shall be construed as conferring any license to intellectual property rights, whether by estoppel, implication or otherwise. This license is revocable at any time. In accordance with the Digital Millennium Copyright Act (‘DMCA’) and other applicable laws, PRC PAC has adopted a policy of terminating, in appropriate circumstances as determined by PRC PAC in its sole discretion, subscribers or account holders who are deemed to be repeat infringers. PRC PAC may also at its sole discretion limit access to the Sites and/or terminate the accounts of any users who infringe any intellectual property rights of others, whether or not there is any repeat infringement. You may not use any metatags or any other ‘hidden text’ utilizing ‘PRC PAC’ or any other name, trademark or product or service name of PRC PAC without our prior written permission. In addition, the look and feel of the Site, including all page headers, custom graphics, button icons and scripts, is the service mark, trademark and/or trade dress of PRC PAC and may not be copied, imitated or used, in whole or in part, without our prior written permission. All other trademarks, registered trademarks, product names and company names or logos mentioned in the Sites are the property of their respective owners. Reference to any products, services, processes or other information, by trade name, trademark, manufacturer, and supplier or otherwise, does not constitute or imply endorsement, sponsorship, or recommendation thereof by us. You may not use a PRC PAC logo or other proprietary graphic of PRC PAC to link to these Sites without the express written permission of PRC PAC Further, you may not use, frame or utilize framing techniques to enclose any PRC PAC trademark, logo or other proprietary information, including the images found at the Sites, the content of any text or the layout/design of any page or form contained on a page on the Sites without PRC PAC’s express written consent. Except as noted above, you are not conveyed any right or license by implication, estoppel or otherwise in or under any patent, trademark, copyright or proprietary right of PRC PAC or any Third-Party. PRC PAC makes no claim or representation regarding, and accepts no responsibility for, the quality, content, nature, or reliability of third-party Websites accessible by hyperlink from the Sites, or Websites linking to the Sites. Such sites are not under the control of PRC PAC and PRC PAC is not responsible for the contents of any linked site or any link contained in a linked site, or any review, changes or updates to such sites. PRC PAC provides these links to you only as a convenience, and the inclusion of any link does not imply affiliation, endorsement, or adoption by PRC PAC of any site or any information contained therein. When you leave the Sites, you should be aware that our terms and policies no longer govern. You should review the applicable terms and policies, including privacy and data gathering practices, of any site to which you navigate from the Sites. We may make Third-Party information and other content available on or through the Sites (the ‘Third-Party Content’) as a service to those interested in this information and we may provide information regarding or access to Third-Party products or services available on or through the Sites (‘Third-Party Products and Services’). Your business dealings or correspondence with such third parties, and any terms, conditions, warranties or representations associated therewith, are solely between you and such Third-Party. PRC PAC does not control, endorse or adopt any Third-Party Content or Third-Party Products, and makes no representation or warranties of any kind regarding the Third-Party Content, including, without limitation, regarding its accuracy or completeness. You acknowledge and agree that PRC PAC is not responsible or liable in any manner for any Third-Party Content and undertakes no responsibility to update or review any Third-Party Content. Users use such Third-Party Content contained therein at their own risk. PRC PAC may run advertisements and promotions from third parties on the Site or may otherwise provide information about or links to third-party organizations, products, or services on the Site. Your dealings or correspondence with, or participation in promotions of, such third-parties, and any terms, conditions, warranties or representations associated with such dealings or promotions are solely between you and such Third-Party. PRC PAC is not responsible or liable for any loss or damage of any sort incurred as the result of any such dealings or promotions or as the result of the presence of such non-PRC PAC advertisers or Third-Party information on the Site. You acknowledge and agree that any feedback, questions, comments, suggestions, ideas, or other information or materials regarding the Site or PRC PAC that are provided by you in the form of email or other submissions to PRC PAC, or any postings on the Sites, are non-confidential and shall become the sole property of PRC PAC. PRC PAC shall own exclusive rights, including all intellectual property rights, and shall be entitled to the unrestricted use and dissemination of these materials for any purpose without acknowledgment or compensation to you. User Content that, in the sole judgment of PRC PAC, is objectionable or which restricts or inhibits any other person from using or enjoying the Interactive Areas or the Sites, or which may expose PRC PAC or its users to any harm or liability of any type. PRC PAC takes no responsibility and assumes no liability for any User Content posted, stored or uploaded by you or any Third-Party, or for any loss or damage thereto, nor is PRC PAC liable for any mistakes, defamation, slander, libel, omissions, falsehoods, obscenity, profanity or objectionable content you may encounter. Your use of Interactive Areas is at your own risk. Enforcement of the user content or conduct rules set forth in these Terms of Service is solely at PRC PAC’s discretion, and failure to enforce such rules in some instances does not constitute a waiver of our right to enforce such rules in other instances. In addition, these rules do not create any private right of action on the part of any Third-Party or any reasonable expectation that the Sites will not contain any content that is prohibited by such rules. As a provider of interactive services, PRC PAC is not liable for any statements, representations, or User Content provided by its users in any public forum, blog or other Interactive Area. Although PRC PAC has no obligation to do so, it reserves the right, and has absolute discretion, to remove, screen or edit any User Content posted or stored on the Sites at any time and for any reason without notice, and you are solely responsible for creating backup copies of and replacing any User Content you post or store on the Sites at your sole cost and expense. Any use of the Interactive Areas or other portions of the Sites in violation of the foregoing violates these Terms of Service and may result in, among other things, termination, or suspension of your rights to use the Interactive Areas and/or the Sites. Except as otherwise provided, you retain ownership of all User Content you post on the Sites. However, if you post User Content to the Sites, unless we indicate otherwise, you grant PRC PAC and its affiliates a nonexclusive, royalty-free, perpetual, irrevocable and fully sublicensable right to use, reproduce, modify, adapt, publish, translate, create derivative works from, distribute, perform and display such User Content throughout the world in any manner or media, including, without limitation, in advertising, fundraising and other communications in support of PRC PAC and the issues, and causes it supports, without any right of compensation or attribution . You grant PRC PAC and its affiliates and sublicensees the right to use the name that you submit in connection with such content, if they choose. You represent and warrant that (a) you own and control all of the rights to the User Content that you post or you otherwise have the right to post such User Content to the Sites; (b) the User Content is accurate and not misleading; and (c) use and posting of the User Content you supply does not violate these Terms of Service and will not violate any rights of or cause injury to any person or entity. In consideration of your use of the Sites, you agree to (a) provide accurate, current and complete information about you as may be prompted by any registration forms on the Sites (‘Registration Data’); (b) maintain the security of your password and identification; (c) maintain and promptly update the Registration Data, and any other information you provide to PRC PAC, to keep it accurate, current and complete; and (d) accept all risks of unauthorized access to the Registration Data and any other information you provide to PRC PAC. You agree to defend, indemnify and hold harmless PRC PAC, its independent contractors, service providers and consultants, and their respective directors, employees and agents, from and against any claims, damages, costs, liabilities and expenses (including, but not limited to, reasonable attorneys’ fees) arising out of or related to any User Content you post, store or otherwise transmit on or through the Sites, your use of the Interactive Areas, or any act or omission relating to the Site or the User Content, including, without limitation, any actual or threatened suit, demand or claim made against PRC PAC and/or its independent contractors, service providers, employees, directors or consultants, arising out of or relating to the User Content, your conduct, your violation of these Terms of Service or your violation of the rights of any Third-Party. EXCEPT AS EXPRESSLY PROVIDED TO THE CONTRARY IN A WRITING BY PRC PAC, THE SITES, THE SITE MATERIALS CONTAINED THEREIN AND THE SERVICES PROVIDED ON OR IN CONNECTION THEREWITH (THE ‘SERVICES’) ARE PROVIDED ON AN ‘AS IS’ BASIS WITHOUT WARRANTIES OF ANY KIND, EITHER EXPRESS OR IMPLIED. PRC PAC DISCLAIMS ALL OTHER WARRANTIES, EXPRESS OR IMPLIED, INCLUDING, WITHOUT LIMITATION, IMPLIED WARRANTIES OF MERCHANTABILITY, FITNESS FOR A PARTICULAR PURPOSE, TITLE AND NON-INFRINGEMENT AND AS TO ACCURACY OR RELIABILITY OF THE INFORMATION, CONTENT, FORMS OR OTHER SITE MATERIALS ACCESSED THROUGH THE SITE. PRC PAC DOES NOT REPRESENT OR WARRANT THAT THE SITES, THE SITE MATERIALS OR THE SERVICES ARE ACCURATE, COMPLETE, RELIABLE, CURRENT OR ERROR-FREE. PRC PAC IS NOT RESPONSIBLE FOR TYPOGRAPHICAL ERRORS OR OMISSIONS, INCLUDING THOSE RELATING TO PRICING, TEXT OR PHOTOGRAPHY. WHILE PRC PAC ATTEMPTS TO MAKE YOUR ACCESS AND USE OF THE SITES AND SERVICES SAFE, PRC PAC CANNOT AND DOES NOT REPRESENT OR WARRANT THAT THE SITES, THE SITE MATERIALS OR THE SERVER(S) ARE FREE OF VIRUSES OR OTHER HARMFUL COMPONENTS; THEREFORE, YOU SHOULD USE INDUSTRY-RECOGNIZED SOFTWARE TO DETECT AND DISINFECT VIRUSES FROM ANY DOWNLOAD. PRC PAC IS ALSO NOT RESPONSIBLE OR LIABLE IN ANY MANNER FOR ANY THIRD-PARTY ACTIVITIES OR EVENTS LISTED ON THE SITES OR FOR THE CONDUCT OF ANY EVENT OR ACTIVITY ORGANIZERS OF OTHER USERS OF THE SITES. PRC PAC reserves the right to change any and all content contained in the Sites and any Services offered through the Sites at any time without notice. Reference to any products, services, processes or other information, by trade name, trademark, manufacturer, supplier or otherwise does not constitute or imply endorsement, sponsorship or recommendation thereof, or any affiliation therewith, by PRC PAC. IN NO EVENT SHALL PRC PAC OR OUR EMPLOYEES, AGENTS OR VOLUNTEERS BE LIABLE FOR ANY DIRECT, SPECIAL, INDIRECT OR CONSEQUENTIAL DAMAGES, OR ANY OTHER DAMAGES OF ANY KIND, INCLUDING BUT NOT LIMITED TO LOSS OF USE, LOSS OF PROFITS OR LOSS OF DATA, WHETHER IN AN ACTION IN CONTRACT, TORT (INCLUDING BUT NOT LIMITED TO NEGLIGENCE) OR OTHERWISE, ARISING OUT OF OR IN ANY WAY CONNECTED WITH THE USE OF OR INABILITY TO USE THE SITES, THE SERVICES, THE CONTENT OR THE SITE MATERIALS CONTAINED IN OR ACCESSED THROUGH THE SITE, INCLUDING, WITHOUT LIMITATION, ANY DAMAGES CAUSED BY OR RESULTING FROM RELIANCE BY USER ON ANY INFORMATION OBTAINED FROM PRC PAC, OR THAT RESULT FROM MISTAKES, OMISSIONS, INTERRUPTIONS, DELETION OF FILES OR EMAIL, ERRORS, DEFECTS, VIRUSES, DELAYS IN OPERATION OR TRANSMISSION OR ANY FAILURE OF PERFORMANCE, WHETHER OR NOT RESULTING FROM ACTS OF GOD, COMMUNICATIONS FAILURE, THEFT, DESTRUCTION OR UNAUTHORIZED ACCESS TO PRC PAC’S RECORDS, PROGRAMS OR SERVICES. IN NO EVENT SHALL THE AGGREGATE LIABILITY OF PRC PAC, WHETHER IN CONTRACT, WARRANTY, TORT (INCLUDING NEGLIGENCE, WHETHER ACTIVE, PASSIVE OR IMPUTED), PRODUCT LIABILITY, STRICT LIABILITY OR OTHER THEORY, ARISING OUT OF OR RELATING TO THE USE OF OR INABILITY TO USE THE SITES OR THE SITE MATERIALS EXCEED ANY COMPENSATION YOU PAY, IF ANY, TO PRC PAC FOR ACCESS TO OR USE OF THE SITES. YOU ALSO ACKNOWLEDGE THAT PRC PAC IS AN INDEPENDENT EXPENDITURE-ONLY POLITICAL ACTION COMMITTEE. ACKNOWLEDGING THAT PRC PAC, ITS TREASURER, AND OTHER DIRECTORS ARE UNINCORPORATED, YOU AGREE TO LOOK ONLY TO THE ASSETS OF PRC PAC FOR PAYMENT OF ANY OBLIGATION THAT MAY BECOME DUE TO YOU FROM PRC PAC. NO MEMBER, OFFICER, EMPLOYEE OR AGENT OF PRC PAC WILL BE LIABLE FOR ANY SUCH OBLIGATION. These Terms of Service and your use of the Site shall be governed by and construed in accordance with the laws of Texas applicable to agreements made and to be entirely performed within Texas, without resort to its conflict of law provisions. You agree that any action at law or in equity arising out of or relating to these Terms of Service shall be filed only in the state and federal courts located in Texas and you hereby irrevocably and unconditionally consent and submit to the exclusive jurisdiction of such courts over any suit, action or proceeding arising out of these Terms of Service. Notwithstanding any of these Terms of Service, PRC PAC reserves the right, without notice and in its sole discretion, to terminate your license to use the Sites, and to block or prevent your future access to and use of the Sites. All contributions to PRC PAC must be made from a contributor’s own funds, not funds provided to the contributor by another person, and using a personal credit card, not a corporate credit card. Contributions may not be made by any federal government contractor nor by any foreign national lacking permanent-resident status in the United States. Contributions to PRC PAC are not deductible for federal income tax purposes. Funds received in response to any solicitation will be subject to federal contribution limits. Federal law requires us to use our best efforts to collect and report the name, mailing address, occupation, and name of employer of individuals whose contributions aggregate in excess of $200 per election cycle.